John Armleder’s art never looks quite like itself. Drawing on what he calls a supermarket of forms, the artist, over the course of a forty-five-year career, has produced works that could pass for Suprematist paintings, Minimalist sculptures, high-design furnishings, and any number of other easily categorized objectsalbeit wryly reoriented, physically or conceptually, as if to delay the moment of recognition. Indeed, sometimes his art isn’t itself, as in his sprawling exhibitions that liberally incorporate others’ works. Yet such tactics speak less to strategies of reference or appropriation than to Armleder’s conviction that agencyof both artist and audienceis activated precisely in this ever more subtle process of self-differentiation. In the gap between the thing as such and the thing as type, between the specific and the general, Armleder’s work finds room to move, instigating the singular mode of participation that he has been developing since his early engagements with Fluxus. Here, critic and curator Fabrice Stroun talks to the artist about a practice that no one, not even Armleder, has been able to pin down. 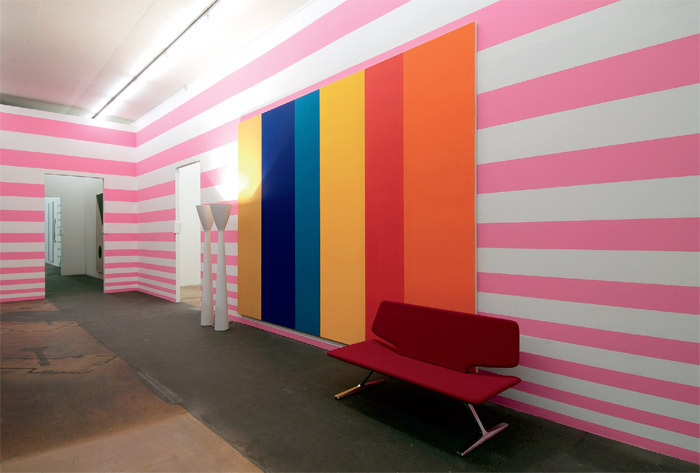 View of John Armleder, “Too Much Is Not Enough, 2006, Kunstverein Hannover, Germany. Photo: Raimund Zakowski. FABRICE STROUN: Over the years, numerous labels have been applied to your work: Fluxus, citationism, neo-geo, and many more, each focusing on a different facet of your practice. Some commentators have even pegged you as a forerunner of the “relational art” and design-as-art moment. To what do you attribute your work’s capacity to resonate with such different, and sometimes even contradictory, contexts of reception? 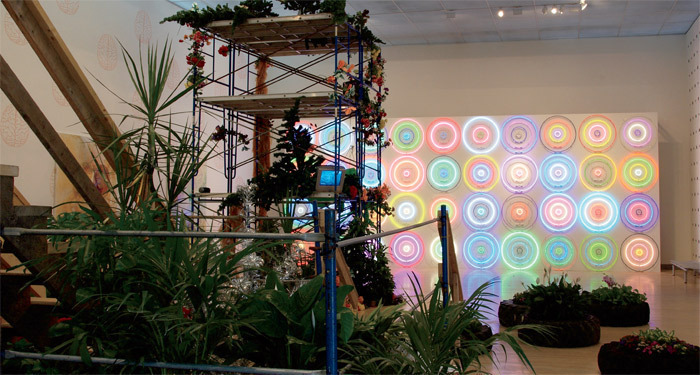 JOHN ARMLEDER: I’ve actually always liked it when my work is included in some new movement, even if the label is restrictive and even if the movement itself is just a fad, because the claim makes the work change. Not physically, of coursebut the understanding of it, for me as well as for others. Whenever that happens, a new horizon suddenly opens upI find myself in a situation I never would have sought on my own. If there were no one to feed on what I do and effect these kinds of unexpected changes, it would all become very sterile to me. It’s a dynamic process: From one moment, one context, one milieu to another, everything shifts. That said, though I may like it when people see my art in such disparate ways, I don’t dwell on it. I have never spent much time considering what other people think about my work, because I myself don’t quite know what I think about it, and whatever it is I think about it changes over time. Most important, I’ve never believed that what I think about my own work has anything to do with the work itself. 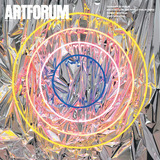 An artwork’s success, in a way, depends on its capacity to co-opt an existing situation and to be co-opted in return. I’m therefore quite happy to see people re-create my work for their own use and to adapt it to their own frames of reference. FS: You’re talking about the distance that separates you from your own production and a concomitant desire to let others take charge of that production. This impulse can seemingly be traced back to the 1960s, when you formed the collective Groupe Ecart in Geneva with your childhood friends Patrick Lucchini and Claude Rychner and began to create aleatory works that, in the spirit of Fluxus, distributed authorship among all participants, whether under the guise of making multiples and books or scripting actions that could be configured in any number of ways. But do you think that your work has certain formal qualitiesor a lack thereofthat have allowed people to use it to so many effects? In the ’80s, for example, critics spoke of the “generic” qualities of your neo-Suprematist abstractions, wherein simple geometric forms and, often, flat colors recall the paintings of the Russian avant-garde. JA: Well, if an artwork were completely generic, or neutral, it wouldn’t exist at all. It’s a nice ideaa utopian construct. But if you’re interested in making work that does exist, you’re forced to align yourself with some sort of precedent, so you’re inevitably going to be constrained, to some degree, by preconceived ideas. As I’ve often said, my ideal would be not to be able to recognize my own work, because that would mean that there’s more to it than those preconceived ideas, more than what I already know. By the same token, if I knew everything about a work from the start, it would become almost pointless to make it. It would be just about me, an ectoplasmic mirror, and that would be very boring. FS: Could you describe your relationship to the repertoire of abstract forms that you have used throughout the years, particularly those inherited from modernism? JA: When I started working in the late 1960s under the banner of Ecart, there were several new movements cropping up every month, so you ended up totally confused because there were so many forms being invented. Paradoxically, you began to have a feeling that maybe everything had already been done. In a way, Fluxus freed me from this problem altogether. I decided that it was OK to make works that looked like things that had been made before: If they were things that I liked, that was enough reason to make them. After all, this is an age-old way of making art. You look at something you like and you try to do the same thing in your own, possibly better way. I’ve always considered geometric abstraction a reservoir, a palette that has been made available by modernity (granting that modernity, of course, is multifaceted and encompasses more than one discourse). My main attraction to these forms initially was their availability. I never considered them to be sacred or mysteriousquite the contrary. It seemed to me that modernity provided us with signs that were meant to be used, whether for understanding the world or for constructing an art piece. FS: Did you have a specific agenda in mind when you decided to reuse this material? JA: When I first made those para-Suprematist works in the mid-1970s, I was interested in a symbolic language that I wanted to put back into play, because what it stood fora new society, revolution, and so onseemed to me to be still valid. We come across forms in a kind of cultural or historical supermarket. Memory, collective or not, makes these forms available, and availability produces meaning. Meaning, as it emerges, then defines our engagement, our politics. Of course, I wasn’t naive. I was well aware that five thousand people had done this same fantastic or not-so-fantastic thing before me for all sorts of different reasons. When you use a form that is already known for something, you should take advantage of the fact that it’s already known. You should also try to validate the form’s original meaning by showing that the meaning is still relevant, although perhaps not for the same reason. Simply stated, the form becomes effective merely because you are reusing it. It’s a kind of recycling. I gather that one central issue is rather silly: Plus ça change, plus c’est la même chose. All that we know, or presume to know, is being continuously reconfigured. There are no settled definitions. Each move we make changes our tastes and ideas. Things look alike. If they don’t, step back, and they will. Step back againthey won’t just look alike, they’ll actually be alike. Step back once more, and they’ll cease to be at all. This is where we ought to be, sometimes. View of “Too Much Is Not Enough,” 2006, Rose Art Museum, Waltham, MA. Photo: Charles Mayer. FS: One thing that I find striking is that, in contrast to the vast majority of works by other artists who have revisited twentieth-century modernism, yours seems devoid of nostalgia. JA: People feel nostalgia for modernism, I think, partly because when we look back at that era, we imagine that its actors had an immediate grasp of the time in which they were living, an awareness of the stakes and the import of what was happening. But of course that is never the case. And as far as we’re concerned, given how radically everything has changed, the beginning of the twentieth century might as well have happened a thousand years ago. We think of modernism as being characterized by an obsession with “tomorrow,” but we’re now living in that tomorrow. We’re right in the middle of the science-fiction scenario that people used to imagine. In fact, we’ve surpassed it in many ways. FS: While you continue to produce paintings, sculptures, drawings, etc., the current reception of your art tends to place emphasis on your large self-curated exhibitions, which often include other people’s work as well as your own. The first one of these shows that I saw left a strongI would even say formativeimpression on me. It was a two-part exhibition at MAMCO [Musée d’Art Moderne et Contemporain, Geneva] in 1997, which occupied three consecutive rooms on the first floor of the museum. How did you arrive at this structure? JA: One part of the show, “Don’t Do It!,” was about standards in contemporary art. The titular work was in the first room: Found objects were piled up in a corner, a repository of things that had been used as readymades since Duchamp. The second room contained dot paintings by other artists. My only direct contribution was a dot wall painting on which all the other works were hung. FS: Some of the paintings were older than the dot paintings you yourself have been doing since the ’80s, while others were the work of much younger artists. JA: It could just as easily have been any other dot paintings by any other artists. I used what was available in the museum’s collection. I wasn’t trying to be comprehensive. None of these large-scale shows have really been about anything other than, perhaps, a way of doing things; here, my intention was to create what you might call a pseudointelligent platform. Dumping ready-made objects in a room as if they’re meant to be thrown out: That’s what I’d call a pseudointelligent ideasomething that’s sort of trying and failing to be smart. The third room appeared to be slightly more sophisticated, although it really wasn’t. It contained a set of monitors showing static shots of paintings, filmed in real time, that were somewhere else in the museum. Many exhibitions evince a kind of intelligence that is very academic. But the ideas behind the MAMCO show were voluntarily dumb. My thinking was that a pseudointelligent idea might trigger an original response more readily than work that proceeds from these very academic premises. FS: You have remade this pile of ready-made junk a number of times since then. Can you describe how it’s done? Like many of your works, it involves a process of delegation. JA: I make a list of obvious possible objects (a bicycle wheel for Duchamp, a rack of neon lights evoking Dan Flavin’s store-bought fixtures, and so on), and the curator, gallerist, or collector who shows the work adds whatever they think should be part of it, and then it’s piled up in a corner. Of course, there’s a certain irony in the fact that I display the objects like a mound of trash even as I designate them as art. Maybe that’s part of the appeal of ready-made objects. Personally, I always liked this notion that a discarded or devalued object is saved and then presented in a way that elevates it to a much higher status than it had when it was functional. In the first couple of versions, the objects that were collected did wind up getting thrown away, but the more recent avatars were frozen, so to speak, and became sculptures. There are some of these that I’ve never seen. There’s one in the hands of a collector who wants to add a few things to it, I don’t know exactly what. It will still be an artwork by me, yet with elements I will probably never see. FS: What you’re talking about here is a transfer not only of authorship but of meaning. This is very clearly the case with, for instance, your furniture sculptureswhere you combine monochrome or abstract paintings with found furnishings, so that a chair, say, becomes sculptures while the paintings may function as decorative pieces of furniture. Or the furniture may be mounted on the wall alongside the painting, so that the objects are radically reorientedalong with our own viewing position. We can see this transposition of meaning not only in your use of found, preexisting objects, but also in your own production, as for instance in your production of fabricated objects and curated projects. John Armleder, Ne Dites pas non! (Don’t Say No! ), 1996, mixed media. 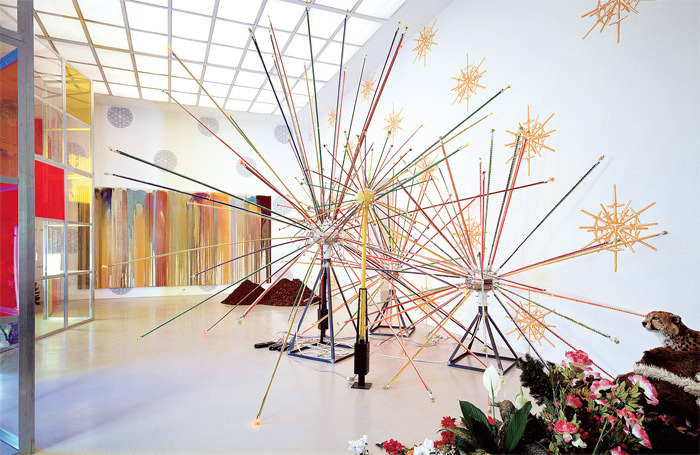 Installation view, Musée d’Art Moderne et Contemporain, Geneva, 1997. Photo: Ilmari Kalkkinen. JA: Well, take the carpets, which are woven copies of my paintings. They were the last things I ever wanted to do. I thought it was the dumbest idea you could have. Nothing gets lower than a carpet, no? One can walk on a carpet, which one tends not to do on a painting . . . But around 1988 I finally went through with it. The models I used for the first two were poor-quality pictures of previous canvases of mine, taken from a catalogue, where the colors were wrong and the design blurred. The fabricators had to approximate the colors as best they could and invent whatever they needed to complete the pieceI didn’t help. Carpets have standard sizes, so they also adapted the painting to the size of the carpet. I showed the carpets as sculptures on very low pedestals, then on the wall as paintings, then as conventional carpets on the floor. That kind of redefinition interests me. FS: This brings us to the notion of display, a concern that is central to your work and that was more obviously thematized in the other chapter of the MAMCO show, “Ne Dites pas non!” [Don’t Say No! ], which comprised a single eponymous work. JA: In that part of the show, I used a single platform rather than three. The idea was to have the same topography and the same inventory in each of the three rooms. So, for instance, if there was a bed in one room, there would be a bed in the next room in the same place; if there was a geometric abstract painting in one room, there would be one in the next; etc. Although this was a “multiple situation,” these were not multiples. The consistent arrangement nevertheless produced a totally new image in each roomso much so that when you moved from one space to another, you forgot almost immediately that you had just seen exactly the same setup. There was just a vague feeling of déjà vu. This elusiveness stemmed mainly from the fact that the objects themselves were all completely different from one another. Many of the components were very broadly defined. 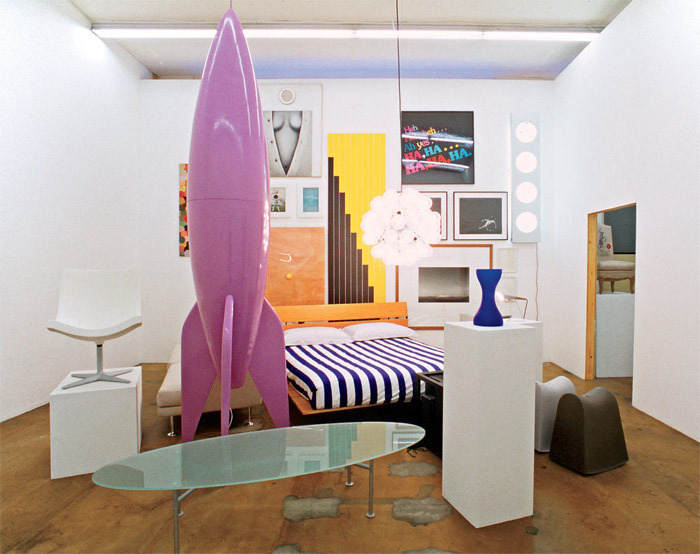 One of the elements was simply “a light source,” which ended up taking the form of an ornate designer lamp in one room and a nondescript, run-of-the mill fixture in another; the third light source was a Dan Flavin neon sculpture. So the specifications were precise but vague at the same time. That’s a dialectic that intrigues me. I tend to think in terms of how far you can go in either direction. Whenever you look at anything, it’s always with a mixture of vagueness and precision, especially if you’re talking about art. FS: It seems to me that these kinds of shows could almost be considered sketches or studies for your much larger recent installations. In 2006, two retrospectives of your work were organized simultaneously, one at MAMCO and one at the Kunstverein Hannover [Germany], with the latter traveling to the Rose Art Museum outside Boston. JA: Well, the Geneva exhibition specifically played with the idea implied by your questionthe notion that you can explain one work through the existence of another, earlier work. I showed new pieces, but we made a real effort to cover all periods of my career, going all the way back to 1967. Some of the Ecart projects had never been completedthey had existed only as scripts up to that point. We completed them specifically for the show. This created a real sense of perspective. You could see there was a connection between one thing and another, and sometimes what seemed like a new work was actually an old one and vice versa. This inability to distinguish new from old suggests that whatever work you produce at the beginning of your career is not yet finished, and whatever appears to be new has been done before, whether by you or another artist. If you understand that, then you’re not going to try to say, “This is about now and about my art today.” It’s about you tomorrow and the next day and so on. If you’re lucky, the work becomes a springboard for something elsesomething that hasn’t yet happened. There is such freedom in the production of art, and so much potential to open up avenues that artists, and people in general, might not have been previously concerned about. That is why it’s a privilege to do what we do. The Hannover exhibition was densely installed, so it was immediately clear to viewers that in many cases one work would have to be read literally through another work. There were wall paintings that served as backdrops to other two-dimensional works, with scaffolding piecessteel armatures hung with garlands of flowerssculptures, and videos in front of them. Then, as an additional layer, I sprinkled cartoons on the topic of art and the (mis-)understanding of art, mostly from the New Yorker, throughout the whole show. You know, all these funny drawings where people in a museum are looking at a pipe or a radiator as if it were a sculpture and so on. So whoever was looking at the artworks was also looking at a spoof of modernist and contemporary art. Presented under glass, the cartoons could be seen as artworks themselves or, because of their small scale, as wall labels of a sort explaining whatever else was in the room. The many misunderstandings such a situation could generate became, in a way, the content of the show. John Armleder, Furniture Sculpture, AH (Enil Aekat), 2006, lamps, paintings, sofa; painting: 9' 10“ x 13' 1 1/2”, sofa: 29 3/4 x 55 1/8 x 26 3/4". FS: There’s always an element of humor in your work. In fact, this has been an unusually sober exchange, considering that in past interviews you have often made use of fictional personae for comic relief. Some exhibitions seem to express this aspect of your practice more directly than others. For instance, your 2009 exhibition at Andrea Caratsch gallery in Zurich, “John Armleder: New Paintings,” was extreme in its almost slapstick nonaction: It simply prolonged the gallery’s previous exhibition of Olivier Mosset’s most recent canvases. Certainly, the collaborative spirit of Ecart has animated many of your projects, as other producers have been brought into your shows in a number of ways. In addition to the curated shows, I could mention your numerous collaborations over the years with Sylvie Fleury and Mosset (sometimes separately and sometimes, under the name AMF, together) or your 2008 show at the Centre Culturel Suisse in Paris, where you simply handed the space over to the interior designer Jacques Garcia to use as he saw fit. But in the exhibition at Caratsch, the notion of collaboration was arguably stretched to the point of absurdity, since, without any intervention whatsoever, the works were now attributed to you. JA: One of the things that was great about the Fluxus artists is that they were undecided as to whether an artwork was a joke or something that demanded some kind of veneration. This vacillation is central to my understanding of my own work and of art in general. If you view something as completely serious or as completely ironic, you’re missing it altogether. Of course, the Caratsch show may come off as an inside jokefor example, a savvy visitor might get a kick out of the fact that Olivier was involved in similar games in the 1960s when he was part of BMPT. But the insider’s aspect of it doesn’t really interest me. You could have someone coming in who knows neither my work nor Olivier’s and who hadn’t seen his previous show. It’s not as if you have the option of explaining it to that personit would be arrogant to slam the conceptual premises in somebody’s face. But that viewer’s perception is still valid and real and makes as much sense as any other. FS: I’m having a hard time imagining you addressing such an unknowing spectator. Isn’t the show addressed instead to a viewer who is privy to your conceptual gesturessomeone like me? JA: No. When I do a show, it’s first and foremost for myself. I want to change the view I have of my work, or in fact to change my work altogether, to retract all of my unneeded contributions to a group of works that I single out for view. I also do it, maybe, for the person running the space, in that case Andrea Caratsch. Secondarily, that show may have been for Olivier, and then for the person who’s clueless, and only then for viewers like you, who know a lot about contemporary art. I don’t mean to suggest that I believe in the existence of an innocent, pure spectator, and furthermore, I’m not discounting the idea that it may be important that I, and the people directly involved, share a good understanding of why I made certain decisions. It brings about a tangible shared knowledge, whether publicly articulated or not. But even if someone is not aware of the ins and outs of my gesture and what it might mean, some knowledge is still transmitted somehowawareness can be achieved through other means than those we tend to describe as knowing. Everybody’s experiences incorporate and resonate with those of other people. Culture, by definition, is a collective beast.